The kissing bug is a very common bug found around Austin, TX. These pests tend to find their way into your home and are usually attracted by lights and warmer areas away from the outside elements. Orange kissing bugs have been mistaken for other insects and belongs to the Reduviidae family of insects which are oftentimes referred to as assassin bugs. 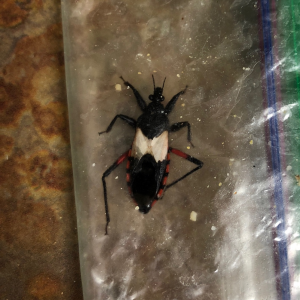 It is one of the few assassin bugs that are attracted to humans and dogs and can be very harmful. If you have the orange kissing bug on your property, call Magic Pest and Lawn to come out and properly treat your property. Why Are They Called the Kissing Bug? These pests are sometimes called other names aside from the kissing bug such as “cone-nose bug”, “masked hunter bug” or “Mexican bed bug”. They are called the kissing bug because they are attracted to the carbon dioxide that you exhale which is why when they bite, they typically bite around the mouth or nose while you sleep. The kissing bug has the ability to transmit a dangerous disease called chagas. Chagas can be a very serious disease causing all sorts of health complications which can sometimes be fatal. If you think you have been bit by a kissing bug, it is recommended to seek medical attention immediately. If you have found a kissing bug, please do not ever tough it with your bare hands! Kissing bugs have a parasite in their feces and their bodies may be contaminated with T. cruzi. If you see a kissing bug, try not to squish it! The feces of the bug transmit the parasite. If you are able to capture the bug without touching it directly with your hands, call your local pest control company, Magic Pest. We will come out to your property and treat it to eliminate the potential of more kissing bugs. The kissing bug removal process can be difficult. There are spray chemicals you can use around your Austin property to kill the kissing bug however, it is recommended that you get a licensed pest control operator from Magic Pest out to treat your property. Inspect window casings outside at dusk: Kissing bugs like to hide in the dark until night when they are searching for their next meal which at that point, they like to move towards the light. Look around your windows and door frames to detect unwanted insects. Check for cracks and gaps in and around your home: Seal windows, walls, roof, and doors and any other crawl spaces below the house where kissing bugs could creep into. Clean up rubbish around house: Clean up any rubbish lying around the outside of your home. Keep pets inside at night: Kissing bugs are attracted to light, especially at night. Let your pets sleep inside at night. Install new, tight fitting screens: Use tight screens on all windows to eliminate the gaps for the bugs to crawl in to. To eliminate the risk of having the kissing bug living in your Austin yard or home, it is best to maintain your property. Don’t leave garbage lying around your property. If your dog lives outside in a kennel, with lights shining nearby at night, you may be exposing your pet to the kissing bug. Our pest control team can properly inspect and take control of the kissing bug removal on your Austin property. Whether you have a major kissing bug infestation or just want to take the steps toward kissing bug prevention in your Austin home, Magic Pest and Lawn offers the safest, customized pest control treatment solutions for you. Contact our Austin pest control professionals to learn more about our orange kissing bug treatment solutions.